Largest convex mirror blank ever created. 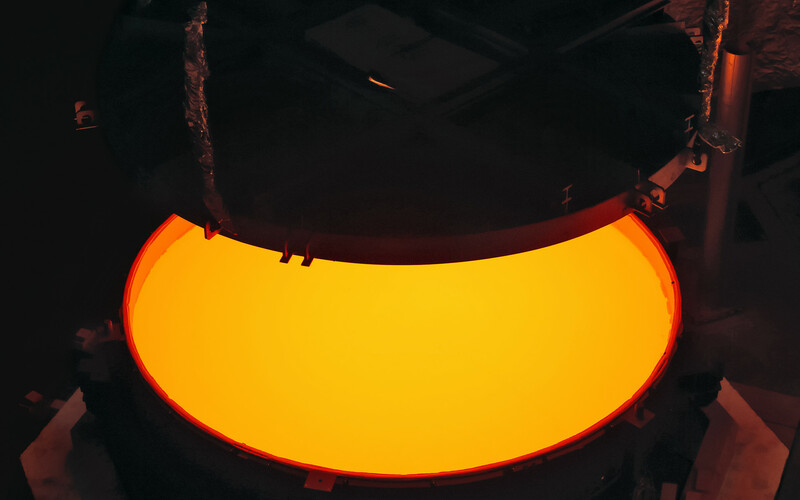 The casting of the secondary mirror blank for ESO’s Extremely Large Telescope (ELT) has been completed by SCHOTT at Mainz, Germany. The completed mirror will be 4.2 metres in diameter and weigh 3.5 tonnes. It will be the largest secondary mirror ever employed on a telescope and also the largest convex mirror ever produced. ESO’s 39-metre Extremely Large Telescope (ELT) will be the largest telescope of its kind ever built when it achieves first light in 2024. A new milestone has now been reached with the casting of the telescope’s secondary mirror (M2), which is larger than the primary mirror of many of today’s research telescopes. The mirror blank is the cast block of material — in this case Zerodur glass-ceramic  — that will then be ground and polished to produce the finished mirror. In January 2017, ESO awarded SCHOTT the contract to manufacture the M2 mirror blank. ESO has enjoyed a fruitful collaboration with SCHOTT, who also produced the 8.2-metre meniscus main mirrors for the Very Large Telescope at ESO’s Paranal Observatory. A manufacturer of exceptional astronomical products to a very high standard, SCHOTT has already delivered the blanks of the deformable thin shell mirrors that will make up the ELT’s quaternary mirror, M4, and will also provide the blank of the tertiary M3 mirror. The blank of the secondary mirror now has to go through a slow cool-down, machining and heat treatment sequence over the next year. It will then be ready to be ground to precisely the right shape and polished. The French company Safran Reosc will carry this out, along with additional testing. The blank will be shaped and polished to a precision of 15 nanometres (15 millionths of a millimetre) across the entire optical surface. When completed and installed, the M2 mirror will hang upside down above the telescope’s huge primary mirror and forms the second element of the ELT’s novel five-mirror optical system. The mirror is strongly curved and aspheric and is a major challenge to make and test. Originally developed for astronomical telescopes in the late 1960s, Zerodur has almost no thermal expansion even when subjected to large temperature fluctuations, is highly chemically resistant, and can be polished to a high standard of finish. Many telescopes with Zerodur mirrors have been operating reliably for decades, including ESO’s Very Large Telescope in Chile.